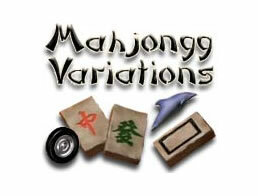 Mahjongg Variations Game - Download and Play Free Version! Want to play a puzzle game that offers tons of variety? 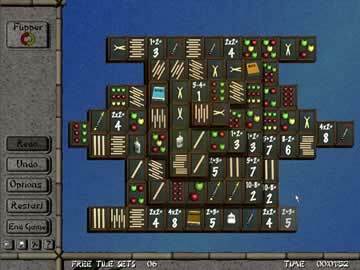 With Mahjongg Variations, you can play mahjongg solitaire in 12 unique ways. Whether you want to play by traditional rules or try mix things up a bit, this unique game will keep you matching tiles for hours. 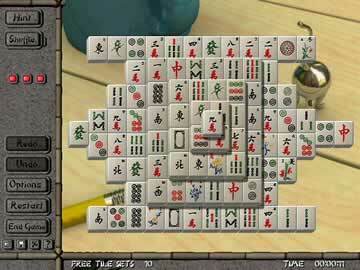 Mahjongg is played by matching two tiles that have the same picture. This is done until there are no more tiles left and the board is completely clear. When matching tiles, they can only be a match if they meet two specific conditions. The first is that the tile cannot have another tile on top of it. In order to meet the second condition, the matching tile must have a free space to either the left or right. It is not necessary for the tiles to have the same image in order to make a match. Since each set of tiles has two special subsets or wildcards, it is possible to make a match containing tiles in the same set. Hints are used when you are stuck and are unable to spot two matching tiles. When there are no matching tiles left, you can shuffle the board. Doing so creates at least one matching pair. Mahjongg Variations contains 12 game modes that include the traditional way to play mahjongg and others that twist the classic rules and contain challenging variations. Simple: This is the only game mode that is not played by traditional mahjongg rules. You are allowed to match any two matching tiles. The only restriction in this game mode is that you cannot match a tile that has another tile on top of it. Easy: Uses traditional rules to match tiles. You are allowed as many hints as you need to clear the board and can also shuffle the tiles around as often as you would like. This game mode is perfect for beginners who are new to mahjongg and you are guaranteed to win the game almost every time in this game mode. Medium: Features classic rules. In this game mode, you are only allowed three hints and three shuffles. This allows you to still receive some help when you are stuck, but it also helps you learn the important role strategy plays in Mahjongg Variations. Hard: The hard game mode does not allow you to use any hints or shuffles and forces you to play by traditional rules. This mode is reserved for advanced players who are seeking an intense challenge. Flip: This tool flips a set of stacked tiles upside down and reverses the order that they appear. Easy pick: Allows you to pick any tile and immediately be shown a match for it. Clone: Lets you copy a particular tile. Swap: With this tool, you can swap the location of any two topmost tiles. Memory: Challenges you by having you remember the location of various tiles. They are all flipped over and you can only make a match by remembering where the match to each tile is. Puzzle: In regular solitaire mahjongg, sometimes you will encounter a particular board that cannot be solved. Puzzle mode is different from all the other game modes since every puzzle has a solution. You play the same puzzle until you are able to solve it, and then you move on to the next puzzle. Zapper: This mode lets you clear matching tiles with a powerful electric blast. Flipper: This game mode helps you clear the board by flipping or reversing the order of the images in a particular column. Time Challenge: The pressure is on in time challenge as you have a limited amount of time to find matching tiles. The amount of time you have is determined by the difficulty option you choose. Extra time is added every time you find a match. Spares and Doubles: Alters the rules of the game in two unique ways. The first is that you are able to match tiles that are doubles, even if they are right next to each other. You are also allowed to pick any tile of your choosing and save it for a spare. The tile will then be stored on the side of your screen.